On the anvil for about a decade, Culture Ministry gets serious about transforming the Ha Noi Opera House and its environs, Thiên Hương reports. The iconic Hà Nội Opera House will ‘open up’ to become the centrepiece of a special cultural space that incorporates the August Revolution Square, the Cổ Tân Park and the Museum of National History. The grandiose plan that would aesthetically and functionally transform downtown Hà Nội and enhance its status as a major tourism destination was announced at recent press briefing by Culture Minister Nguyễn Ngọc Thiện. Thiện said his ministry would invite foreign consultants to landscape the area around the Opera House. The Opera House itself would be renovated, surrounding fences removed and the café beside it turned into an open park that connects with the August Revolution Square in front of it. The new site would be one that presents both featuring traditional and contemporary shows of fine arts and performing arts, he said. The plan has been supported by the city’s leaders. “We will finish choosing consultants and preparing a draft plan by the end of this year,” said Nguyễn Thái Bình, a ministry official. “The State budget would be used for a part of the project expenditure, with the rest contributed by individuals and organisations,” he added. Renowned architect Hồ Thiệu Trị, who directed renovation of the Opera House in 1995, welcomed the idea of a new cultural space. “It (Opera House) is a special historical building with a special cultural meaning. This project will enhance the special image of the capital city in the world,” Trị told Việt Nam News." “The plan of rearranging spaces around the Opera House and connecting with nearby museums has been considered since 1992,” said Đào Ngọc Nghiêm, vice chairman of Hà Nội Urban Planning and Development Association. Another architect, Trần Huy Ánh, said that associating the Opera House with neighbouring buildings and parks was the original plan of the French when they built it more than a hundred years ago. Ánh recalled a similar project proposed by Prof Tôn Đại and his students, which won high appreciation. Ánh stressed that the Opera House was among five historical buildings in the area, including the Revolutionary Museum in Tông Đản Street (the first building in Hà Nội with pre-colonial architectural features), the National Museum of Vietnamese History, the Guest House of the Ministry of Defence, and the Museum of Geology on Phạm Ngũ Lão Street. “These buildings have been divided into small spaces for cafes, restaurants and car parking,” Ánh said, adding a “general plan for architectures in the area is needed to bring into full play the real values of these buildings”. Architect Nghiêm noted that future tasks are not limited to opening up spaces. They also involve relocating some offices in the area to the outskirts. “In the past decades, there have been many workshops and contests on the cultural space surrounding the Opera House,” Nghiêm said, but it was seen as a “headache for the city authorities to move some agencies, including the General Department of Geology, to the outskirts”. Architect Hoàng Thúc Hào noted that there were two parks on either side of the Opera House that should be linked when creating an open space for public. “To make this happen, it will be necessary to rearrange traffic routes and create pedestrian zones,” Hào said. Nghiêm suggested that authorities poll city residents, experts and other sectors to prepare a master plan for the project. “We should open design contests for special spaces like Cổ Tân Park that will include sculptures, grass, flowers and benches,” he said. Architect Trị suggested that with the Opera House being the centre point of the open space, the axis should run east-west from the House towards the Hồng River. To the west of the Opera House is Tràng Tiền Street, which runs into the green space of Hoàn Kiếm Lake. Commercial activities on Tràng Tiền should be continued, he said. “On the north-south axis, we should maintain the green public spaces on Phan Chu Trinh, Lê Thánh Tông and Lý Thái Tổ streets,” he said. "The Opera House should also connect with plans to develop both banks of the Hồng River with green spaces, forming a united complex," Trị added. Opera House Director Nguyễn Thị Minh Nguyệt said the idea of the cultural space had just been proposed by the Culture Ministry. The Opera House has not been assigned any concrete duties. She noted that the Hà Nội Opera House carried great historical and architectural value for the nation. 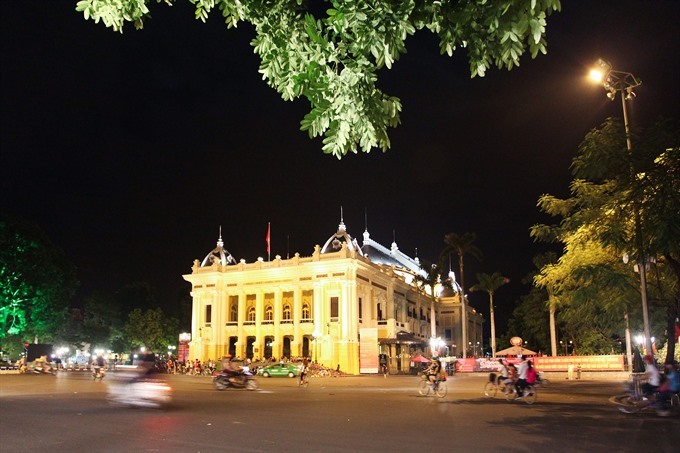 Along with the August Revolution Square (formerly called Theatre Square), it was the scene of great events associated with the August Revolution and the early years of the Democratic Republic of Việt Nam. On August 17, 1945, at the Theatre Square, a meeting was held to introduce the Việt Minh (Việt Nam Independence League) Front. On August 29, 1945 the North Vietnamese Army was introduced at the Theatre Square. In early October 1945, a meeting was held in the Theatre Square in support for resistance against the return of French troops in South Việt Nam. 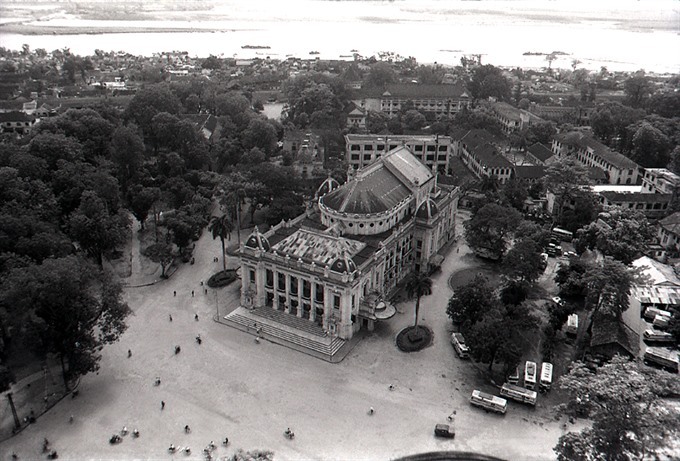 On May 3, 1945, the National Assembly of the Democratic Republic of Việt Nam held its first meeting at the Opera House. Since then, the Opera House was the venue for National Assembly meetings until the Ba Đình Meeting Hall was constructed in 1963. After nearly a hundred years of use, the Opera House underwent a major renovation led by famed architect Hồ Thiệu Trị between 1995 and 1997.